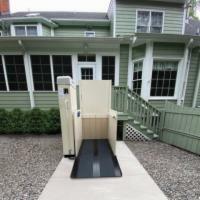 Residential Vertical Platform lifts are designed to smoothly and safely transport both you and your mobility device. Not only are they a convenient solution to accessibility challenges, they also a great tool for those interested in aging in place. Choose from new and reconditioned units and different weight capacities to find the perfect lift for your home, your budget, and your mobility device. Each and every lift is constructed using only the highest quality components and expert craftsmanship. Our products also come with the nation’s best warranty and are built to exceed national safety standards. 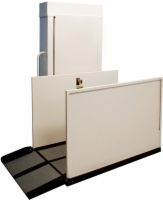 Call or visit AmeriGlide of Southport, NC today to speak with an expert and purchase your residential vertical platform lift. W 34"-36" x L 54"-60"
Price shown for 64" model. Upgrades to 44", 78", 98", 115", and 130" heights are available. A 750 lb. weight capacity. See if a DC model may be right for your home. Price shown for 53" model. Upgrades to 101" is available. This reconditioned vertical platform lift has a 600 lb. weight capacity and a solid platform. Residential use. 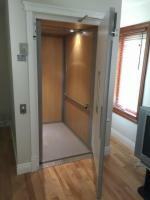 The Residential vertical platform lift has a 600 lb. weight capacity and a solid platform. 750 lb. weight capacity, with battery backup.